(CNN) -- The World Health Organization cautioned that the swine flu outbreak could gain momentum in the months ahead, despite claims by the health secretary of Mexico -- the epicenter of the outbreak -- that the virus "is in its declining phase." The number of confimed cases of the H1N1 virus continue to multiply. 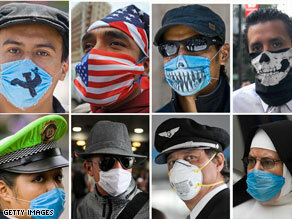 As of early Monday, Mexican health officials reported 568 cases and 22 fatalities linked to the flu. WHO says it has confirmed 506 cases and 19 deaths in Mexico. The world has 985 confirmed cases of the virus, known to scientists H1N1 virus, in a total of 20 countries, WHO said Monday. The United States has reported 226 confirmed cases in 30 states. The U.S. cases include one death -- a Mexican toddler visiting relatives in the United States. According to WHO, Canada has 85 confirmed cases; Spain has 40; the United Kingdom has 15; Germany has 8; New Zealand has 4; Israel has 3; El Salvador has 2; France has 2; and Austria, China, Colombia, Costa Rica, Denmark, Ireland, Netherlands, Italy, South Korea and Switzerland each have one. The outbreak is only about 10 days old, and even if the illness is declining, it could return, said Gregory Hartl, the WHO spokesman for epidemic and pandemic diseases, at a briefing Sunday. "I ... would like to remind people that in 1918 the Spanish flu showed a surge in the spring, and then disappeared in the summer months, only to return in the autumn of 1918 with a vengeance," Hartl said. "And we know that that eventually killed 40 million to 50 million people." Mexican authorities believe the most active period of the virus in Mexico was between April 23 and April 28, and Mexican Health Secretary Jose Cordova described the outbreak as being in decline in his country. In China, officials have quarantined 68 people, including 13 crew members, who were passengers of a Mexico City to Shanghai flight, which carried a passenger who tested positive for the virus, China's state-run Xinhua news agency reported Sunday. None of the other passengers has exhibited any flu-like symptoms, one health official said. About another 110 people who were on the Aeromexico plane went on to other destinations, and may face quarantines elsewhere, the news agency said. Fifteen have been quarantined at a Beijing hotel. Shanghai's airport is now barring other Aeromexico planes from landing there, a representative of the airline told CNN. Aeromexico is suspending flights to Shanghai until May 15, the representative said. The airline does not fly to Hong Kong or Beijing. In the United States, New York has the most confirmed cases, with 63, according to the Centers for Disease Control and Prevention. Texas has 40; California has 26; Arizona 18; South Carolina 15; Delaware 10; Massachusetts and New Jersey each have seven; Colorado has four; Florida, Illinois, Indiana, Ohio, Virginia, Wisconsin each have three; Connecticut, Kansas and Michigan each have two; Alabama, Iowa, Kentucky, Minnesota, Missouri, Nebraska, Nevada, New Hampshire, New Mexico, Rhode Island, Tennessee and Utah each have one. California officials suspended visitation and other "nonessential activities" at Centinela State Prison in Imperial County after an inmate was suspected of having swine flu. The case has yet to be confirmed with lab testing. On Sunday, health officials in North Carolina and Pennsylvania announced the first confirmed cases in those states, and Louisiana's governor said his state had seven confirmed cases. The cases from those three states were not immediately included in the CDC tally. In Washington, U.S. Secretary of Health Kathleen Sebelius, appearing on CNN's "State of the Union," warned that even if the flu outbreak wanes, "it could come back with greater force in the winter and fall, when we get into flu season." "So, this is no time for complacency," she said. "We want to stay out ahead of this." Dr. Anne Schuchat, the CDC's interim deputy director for public health, told reporters Sunday that she was "heartened" by Mexican authorities' reports but still is "very cautious." "I know that influenza can be surprising, and the time course here in the United States is later. We believe we're just on the upswing here, and in several parts of Mexico, cases began quite a while ago," Schuchat said. "From what I know about influenza, I do expect more cases, more severe cases and I do expect more deaths," she added. "And I'm particularly concerned about what will happen in the fall." Acting CDC Director Richard Besser, also speaking on "State of the Union," said U.S. health officials are examining whether people who received flu shots for the swine flu in 1976 may have some level of protection from the current swine flu. "That's going to play in very, very big as we move forward with our plans around vaccines, because that may help guide some of the issues around who is most at risk at getting this in the future," Besser said. Offering a general picture of the state of U.S. efforts to combat the virus, Besser said "there are encouraging signs." "We're not out of the woods yet," he said. "But what we've learned about the virus itself -- it doesn't contain the factors that we know are seen in much more severe flu strains." While the new virus strain in the recent outbreak has affected humans, Canadian officials said it has shown up at a pig farm in Alberta, Canada. Officials said the pigs may have been infected by a Canadian farmer who recently returned from a trip to Mexico, the epicenter of the outbreak. The pigs have since been quarantined. "We have determined that the virus H1N1, found in these pigs, is the virus which is being tracked in the human population," said Dr. Brian Evans of the Canadian Food Inspection Agency. iReport.com: How should H1N1 be handled?